As the Titanic and her passengers sank slowly into the Atlantic Ocean after striking an iceberg late in the evening of April 14, 1912, a nearby ship looked on. Second Officer Herbert Stone, in charge of the midnight watch on the SS Californian sitting idly a few miles north, saw the distress rockets that the Titanic fired. He alerted the captain, Stanley Lord, who was sleeping in the chartroom below, but Lord did not come to the bridge. Eight rockets were fired during the dark hours of the midnight watch, and eight rockets were ignored. The next morning, the Titanic was at the bottom of the sea and more than 1,500 people were dead. When they learned of the extent of the tragedy, Lord and Stone did everything they could to hide their role in the disaster, but pursued by newspapermen, lawyers, and political leaders in America and England, their terrible secret was eventually revealed. 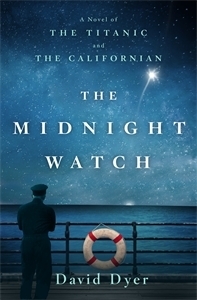 The Midnight Watch is a fictional telling of what may have occurred that night on the SS Californian, and the resulting desperation of Officer Stone and Captain Lord in the aftermath of their inaction. Told not only from the perspective of the SS Californian crew, but also through the eyes of a family of third-class passengers who perished in the disaster, the narrative is drawn together by Steadman, a tenacious Boston journalist who does not rest until the truth is found. David Dyer's The Midnight Watch is a powerful and dramatic debut novel--the result of many years of research in Liverpool, London, New York, and Boston, and informed by the author's own experiences as a ship's officer and a lawyer. I feel like the only person who didn’t fall for David Dyer’s The Midnight Watch: A Novel of the Titanic and the Californian. I’ve been in the minority before, it’s no big deal, but I wanted to like this one and I am rather disappointed it didn’t work out. I personally found the general idea is fascinating and give Dyer a lot of credit for attempting it. Explaining what might have prevented the Californian from acting proved a refreshing angle. Off the top of my head, I can’t think of a comparable narrative and I enjoyed the contrast this story provided alongside others featuring the disaster. I was also impressed with the author’s utilization of the historic record. I think Dyer’s use of context masterful and feel his manipulation of the material intensely creative. A great deal of research went into this piece and as a fan of the genre, I couldn’t help admiring the dedication that so obviously went into the creation of this piece. I preached a desire to see male protagonists at the Historical Novel Society Conference in Denver last year and Dyer’s work made that wish a reality in the best way. He creates a diverse cast of flawed individuals with a wide range of personal experiences. The story is naturally quite masculine in tone, but the novel doesn’t suffer for it and I hope the powers that be recognize that fact and open the door for more male protagonists. Unfortunately for me, certain elements of the story’s structure undermined the novel’s strengths. I don’t mean to sound cruel in this admission, but the monotony of the narrative put me to sleep on more than one occasion. Despite all that I appreciated, there simply wasn’t enough movement to engage my imagination. So responsibility for action fell like a snowflake from the sky, landing gently between them, touching neither. And in this concentrated moment in history, nothing was done.